You may use this form to notify OIT of a suspected phishing attempt. The types of emails that are of high concern are those that ask for information from the recipient, such as login information. When you do recognize a phishing email it helps to report it directly to Google so they can analyze and block it more quickly. 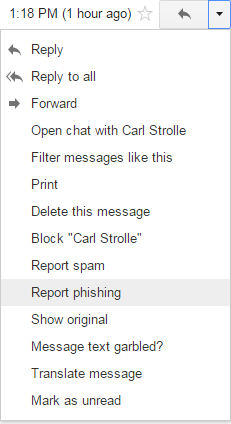 From the gmail interface in a web browser choose Report Phishing from the drop down menu next to Reply (see image, right). Reporting the email to us is important as well so we can start our internal security procedures. Thank you for your assistance!